Being familiar with the story of the Wymeswold chalice, we were surprised to read in J B Firth's Highways and Byways of Leicestershire, published in 1925, that Wymeswold Church... "once possessed a precious treasure in a rare Tudor chalice of the date 1521". Firth went on to say that there was "...only one other like it in the country, but it was sold and now belongs to a private collector! It last changed hands at the Dunn Gardner sale". We asked a couple of the Wymeswold residents in the Organisation if they could throw any light on the matter, but drew a blank, and decided to find out for ourselves whether the chalice referred to by Firth as having 'once' belonged to Wymeswold was the one which had attracted so much publicity, and which we had seen for ourselves in the Leicester Museum. To begin with, Firth's remarks about it being sold, were somewhat ambiguous; was he talking about the Wymeswold cup or its twin, and when was the Dunn Gardner sale? We are lucky enough to have a copy of Kelly's Directory for 1912, and sure enough, it refers to a "silver chalice of pre-Reformation date, with the hall mark of 1512" and also a flagon and paten given in 1705 by Dame Catherine Leeke. Our next step was to check in the Inventory of the Church Plate of Leicestershire, published in 1890 – no mean feat; although there appear to be plenty of copies of Volume II, we, and the Loughborough Library staff, managed to locate none of the four copies of Volume I which the Library Service apparently owns. However, we eventually found one in the Leicestershire Record Office. The hall mark is described as "... a small black-letter P in outline shaped to letter, a leopard's head crowned within a circle, and a tun in an oblong, and the date is given as 1512", it is shown in Appendix E of the Inventory as being recorded in 1832 by Archdeacon Bonney, who said it was "... of ancient shape, unlike any I have yet seen". Inventory of the Church Plate of Leicestershire. So the chalice had been held by Wymeswold Church since before 1832 and, assuming the directory was revised regularly, it was still there in the first decade of this century. The Inventory also clarifies the Dunn Gardner connection. It reads "This pre-reformation cup, the only piece as yet known to be stamped with the hall marks of 1512, is thought to have originally been a ciborium or pix. It is almost exactly like one with a cover, belonging to St Mary's church, Sandwich, and closely resembles another made in 1521, owned by Mr J Dunn Gardner, and exhibited by him in the South Kensington Museum." Disappointingly, although the Inventory devotes two pages to the Dame Katherine's flagon and paten, there is no clue to the history of the chalice. The 'silver cup' listed and pictured in the Inventoryis without doubt the Wymeswold chalice, so who was Firth's informant? Did it in fact ever leave the village, or was it just lost? Could it even have been hidden away for safety during the war – certainly the evidence points to it disappearing around that time? Any ideas, theories or stories?? 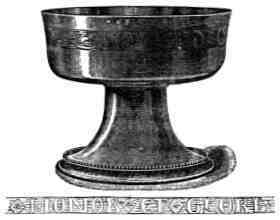 The Inventory of the Church Plate of Leicestershire describes the chalice as a silver cup weighing 9.1oz with a height of three-and-three-quarter inches. The diameter of the bowl is given as four-and-a-half inches, that of the foot three-and-seven-eighths, and the height of the stem two-and-a-half. The hallmarks are a "small black-letter P in outline shaped to letter" a "Leopard's head crowned within a circle" and "a tun in an oblong". The Inventorythen goes on to say that "This cup has a wide, shallow, straight-sided bowl resting on a conical stem and foot. Round the bowl in Tudor letters is 'Soli Deo Honor et Gloria', engraved perhaps when this piece was first used as a communion cup: the background of the inscription is covered with zigzag lines. Round the top of the stem is a cable moulding, a beaded moulding running round the upper edge of the foot; the lower edge of the latter is turned round upwards. Traces of gilding are to be seen on the engraved band round the bowl, and also on the foot." Originally published in the WHO Newsletter 1994.